In the film, after having the greatest time of his life three summers ago, Lenny (Adam Sandler) decides he wants to move his family back to his hometown and have them grow up with his gang of childhood friends and their kids. They’ll face new challenges and meet new friends in the next chapter of the epic story of refusing to grow up. Columbia Pictures presents a Happy Madison production, a film by Dennis Dugan, “Grown Ups 2.” Starring Adam Sandler, Kevin James, Chris Rock, David Spade, Salma Hayek, Maya Rudolph, Maria Bello, and Nick Swardson. Directed by Dennis Dugan. Produced by Adam Sandler and Jack Giarraputo. Written by Fred Wolf & Adam Sandler & Tim Herlihy. Executive Producers are Barry Bernardi and Allen Covert. Director of Photography is Theo Van de Sande, ASC. Production Designer is Aaron Osborne. Editor is Tom Costain. Costume Designer is Ellen Lutter. Music by Rupert Gregson-Williams. Music Supervision by Michael Dilbeck, Brooks Arthur, and Kevin Grady. The first “Grown Ups,” released in 2010, grossed $271 million worldwide, making it Sandler's most successful film to date. 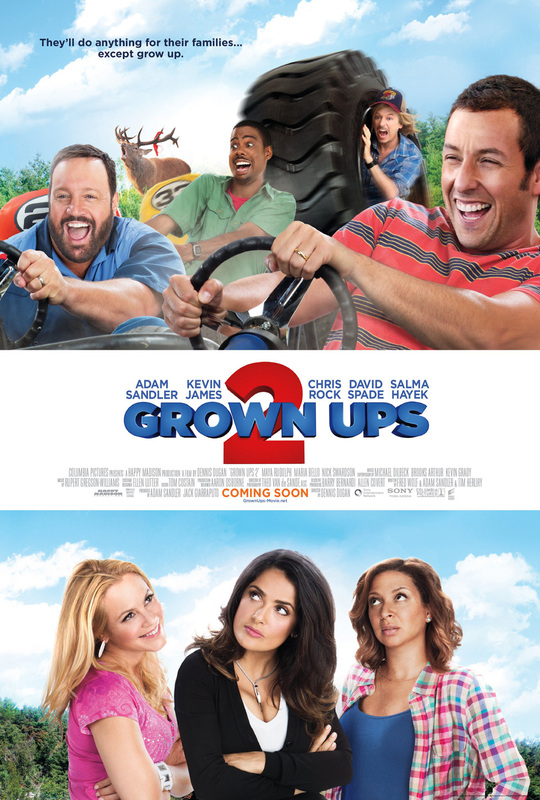 Opening across the Philippines on July 24, “Grown Ups 2” is distributed by Columbia Pictures, local office of Sony Pictures Releasing International.